Give any old pincushion a good squeeze and you know what you’ll find buried in the middle? Unlike pins, there are no heads to keep them from disappearing into the middle of the cushion – never to be seen again. I’ve tried leaving a bit of thread through the eye of the needle, but that just makes it messy and doesn’t help much. So I invented a needle cushion. 🙂 It’s shallow – so the needles can’t disappear inside. It has a hard surface on the bottom so it stays flat, and so the needles can’t poke through and scratch the table underneath. I LOVE my new needle cushion! I need to make a couple more – including one to hold sewing machine needles. I usually have a stretch needle, a heavy duty needle, a fine needle and/or a standard needle sitting on the table next to my machine at any given time. And they’re super easy to make. I’m not even going to do a PDF for this one because there are just a couple of steps. Ready? First – cut two fabric rectangles 4 inches wide and 2 3/4 inches tall. Put them right sides together. Using 1/4 inch seam allowance, sew it up around three sides. Trim off the corners close to, but not into, the seam allowance. Turn it right side out. Turn the raw edges in 1/4 inch and press so you have a nice crease to follow when you do the hand stitching to close it up after stuffing. Now – pack a few pinches of stuffing in on top of the credit card. Use a chopstick or other pointy tool to get it neatly into the corners. Sew up the end using either whip stitch or ladder stitch. And you’re done! Easy peasy. Mist excellent! Yes, best credit card use ever!!!!! Oooh – good use of old gift cards! This is super awesome. I don’t have any expired cards at the moment (that haven’t but cut into tiny pieces), but I’ll have to keep this in mind next time! Here’s a solution to a problem I didn’t even know I had. Great idea! Thanks for sharing. I will make two – one for hand sewing needles and one for machine needles – I am like you with having more than one needle on the go. I don’t know how you keep track of what type and size of needle you have out. I colour code each type with a different colour of nail polish and keep a card listing all of them. One time when I picked up my machine after a repair, the mechanic had removed the needle. He thought it had encountered a problem while I was sewing. At least until I explained. Genius! Genius, I tell you! Thank you so much, because this is a big problem for me. Although, so it just plain losing needles. I try very hard to keep thread on them so they are easier to spot, but…. Excellent idea! I love the re-purposing of the credit card! If you don’t have any cards to recycle, you could cut up lids from plastic butter tubs or those deli containers. It seems like a get a credit card offer (with faux credit cards enclosed) nearly every week. 🙁 But using plastic lids in a brilliant idea! I can’t recycle them where I live and I hate throwing them away. This is a FABulous idea. Loveee it…. I get the gift cards at WalMart and use them in their gas station to save 5 cents per gallon. I always end up with a couple extra so now I have a great use for them! Thank you! I’ve made two now. One for me and one for my daughter. SEW nice!!! Thank you. What a fabulous inspirational idea. Thank you for posting this. Great idea! 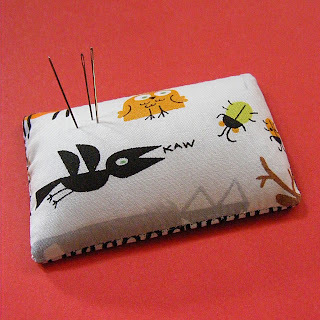 I was hand sewing on the go this winter and my sewing bag squished a bunch of needles into my pin cushion :c, so a couple of needle cushions would be great. Please would you allow me to make and sell a few very few of these to sell to raise funds for Cancer Research UK.